All batteries have a limited life span. Plus, the life of a battery is difficult to predict as it will vary with application; frequency of usage; level of maintenance; and depth of discharge. Undercharging, overcharging and heat affect the life of your battery. 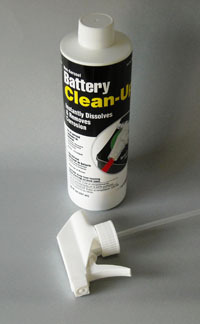 Diluted electrolyte (water and sulfuric acid mix); low electrolyte levels; loose and corroded electrical connections; and an unbalanced battery bank make it more difficult for even good batteries to do their job. Here are some helpful tips. Batteries properly filled with clean, distilled water is essential. Under-filling keeps your battery from charging properly and can reduce the batteries capacity long term. Batteries will gas (bubble) towards the end of charge. This is called “equalizing” and ensures that the electrolyte is completely mixed and the batteries reach peak charge. Over-filling can cause acid to spill-over during charging which dilutes the acid and loss of battery capacity. Plus it will damage terminals, cables, lugs, battery hold-down rods and even the battery trays. Do not bring the water level into the Vent Well or corrosive fumes/liquid will be vented during charging and will cause corrosive damage as noted above. Fully charge the batteries prior to adding water unless the water is below the top of the lead plates. In this case add just enough water to cover the tops of the plates, then charge, and continue with watering to the Maximum Liquid Level after charging is complete. Always plug-in your charger after every use! This helps prevent sulfation, the #1 killer of batteries and it ensures your batteries will be at full charge the next time you are ready to use your cart. This procedure also lessens the chance of your batteries dropping below 50% state-of-charge which is the point at which sulfation build-up on the battery plates is accelerated. Sulfation greatly affects your battery’s life and capacity. If your charger is a modern “Smart Charger” type, or it has a final “Float” stage built into the charger, it is designed to let you leave your batteries plugged-in and unattended for months at a time. 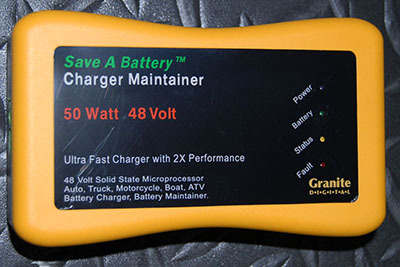 These types of chargers keep the batteries fully charged by turning off-and-on automatically or by providing a low current pulse-type trickle charge flowing into the batteries. 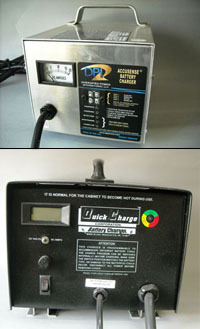 Lead-acid batteries, by their chemical make-up, inherently lose a small amount of charge every day. This is called “self-discharge”. Hot temperatures act as a catalyst and increases the rate of a batteries discharge. This is why a trickle charger (See Photo 1 and Photo 2) is especially beneficial in keeping batteries fully charged during long periods in hot climates. Trickle chargers not only negate self-discharge, but they eliminate sulfation, and, they keep the electrolyte mixed so the water and acid (which is heavier than water) does not sink to the bottom of the battery case causing stratification. 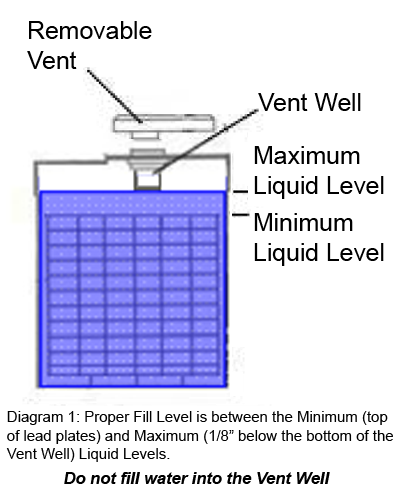 Stratification causes accelerated water evaporation (especially in hot weather as the water is closer to the vent caps), and, the acid concentration at the bottom of the battery case can cause deterioration of the lower part of the battery’s lead plates. 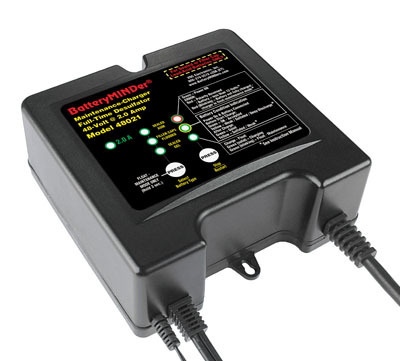 Trickle chargers with built-in desulfators and float mode (See Photo 2) offer an additional advantage of keeping your battery plates clean and free of sulfation. This allows your batteries to be running at maximum capacity during their life span. The trickle charger can potentially extend the life of your golf cart batteries making them a wise investment. Proper Cleaning and Maintenance: If you notice an acid film/liquid or corrosion (See photos 5, 6, 7) on top of the battery or terminals care should be taken to clean it off to minimize damage to battery cables, terminals and other cart components. 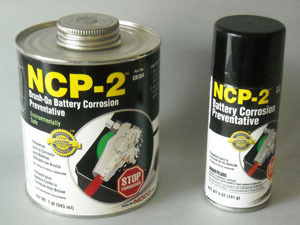 A battery acid neutralizer (See Photo 3) will neutralize and remove the acid. After cleaning treat the battery terminals, cable lugs and hold-down rod nuts/washers with battery lifetime guarantee corrosion preventative (See Photo 4) for long-term prevention. Make regular visual inspections of cables and cable lugs which appear weak or thinning, loose connections, or corrosion on cables and terminals. These are signs of “high resistance connections” which reduce power to your cart motor and accessories and prevent optimal charging. More important, the heat caused from the high resistance connection can cause battery terminals to melt and batteries to potentially explode. Battery Boys has battery cables, cable lugs, acid neutralizers, corrosion preventatives and all of your battery accessory needs in stock for your convenience. We also stock all types of maintenance chargers, smart chargers, trickle chargers and trickle chargers with built-in desulfators and float mode.